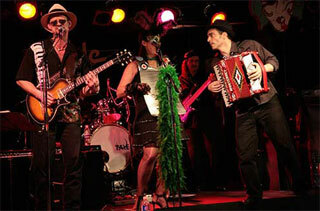 With all the energy of New Orleans Mardi Gras, Mojo Zydeco delivers the true spirit of Louisiana! Zydeco is an evolving form of dance music based on the traditions of the Black Creoles of Southwest Louisiana. After a long working day the Creoles would gather in private houses and dance halls throughout Southwest Louisiana, dance and carry on. Zydeco music features the Accordion as the lead instrument. The King of Zydeco, Clifton Chenier, developed the Rubboard in the early 1950¹s. Based on the washboard, this unique instrument is a vital part of the infectious Zydeco rhythm. Combined with the electric bass and percussive drums, today¹s Zydeco music drives the dance halls and clubs of New Orleans, and beyond, to an unforgettable event. A "Good Times" band, Mojo Zydeco brings people from all ages and backgrounds together to dance and share in the experience. One thing is guaranteed, once you¹ve been to a Mojo Zydeco event, your feet will always find their way back! Noteable Entertainment & Events is a Vancouver based booking agency, party rental, entertainment services and event production company. If you are interested in booking Mojo Zydeco please contact us.